So you’ve been asked to parse some dates, except the years are two digit years. For example, dates like “12 Jun 30” are ambiguous…or are they? If “12 Jun 30” is intended to express a birthday, given it’s 2019 as the of writing of this post, we can assume it means 1930. But if the input is “12 Jun 18” is that last year, or is that a 101 year old person’s birthday? The initial value for this property comes out of the DEPTHS of the region and languages portion of the Control Panel. 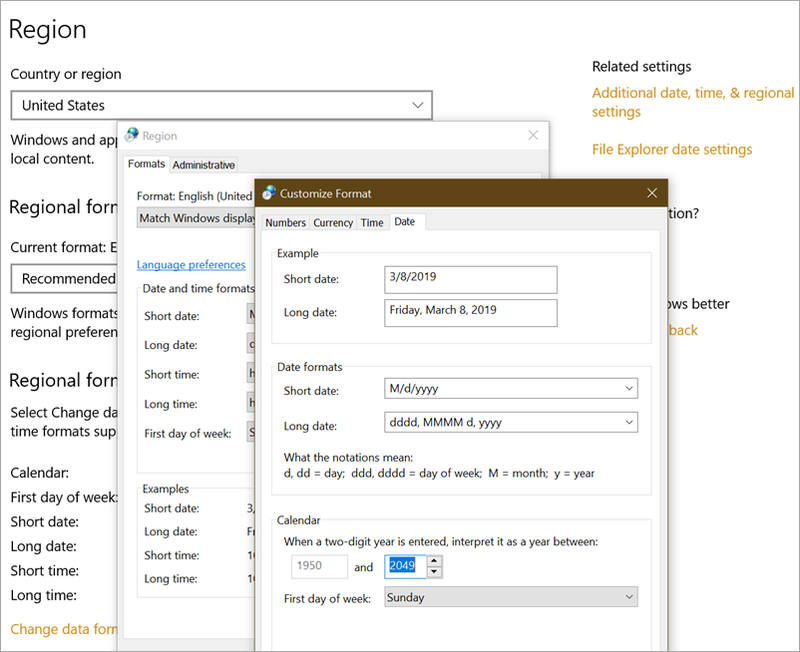 Note way down there in “additional date, time, & regional settings” in the “more settings” and “date” tab, there’s a setting that (currently) splits on 1950 and 2049. If you’re writing a server-side app that parses two digit dates you’ll want to be conscious and explicit about what behavior you WANT so that you’re not surprised. Setting TwoDigitYearMax sets a 100 year RANGE that your two digit years will be interpreted to be within. You can also just change it on the current thread’s current culture’s calendar. It’s up to you. Note that I’ve changed TwoDigitYearMax from and moved it up to the 1999-2099 range so “30” is assumed to be 2030, within that 100 year range.